Botham Marquees is a family run business with over 25 years of experience in providing quality marquee hire in Surrey and the south of England. Our highly personal service offers outstanding flexibility and attention to detail that will help make any event a success. Click on the image below to view our gallery. All of the above can be selected individuly, to create a bespoke marquee setting for your occasion or event. We ask that you contact us and tell us your requirements so that we are able to put together a complete package. Why is a marquee a good idea? 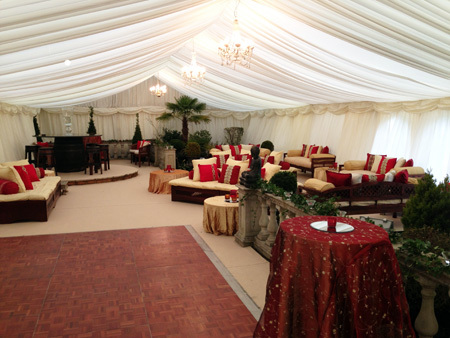 Marquee hire is a simple, practical but elegant way to maximise the capacity and potential of your venue. By transforming otherwise overlooked outdoor areas using one of our marquees, you are creating a warm, sheltered and sophisticated area for your guests or clients. We take great pride in providing first class customer service and affordable products. So please don't hesitate to contact us for any further information.